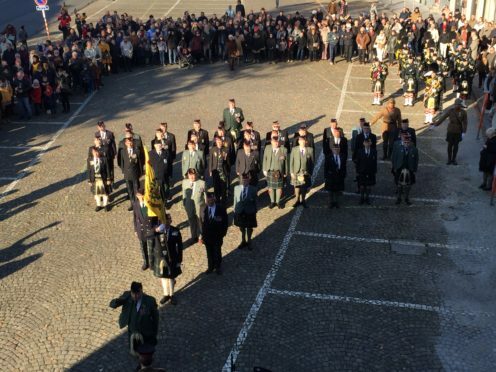 The Mayor of Chièvres decided to arrange a centenary remembrance of the historic union and, as a result, last weekend 70 members of the Gordon Highlanders Regimental Association travelled to Belgium to mark 100 years since the event. A parade of 50 veterans, led by Lt Col Gordon McKen, have now marched through the streets of Chièvres. 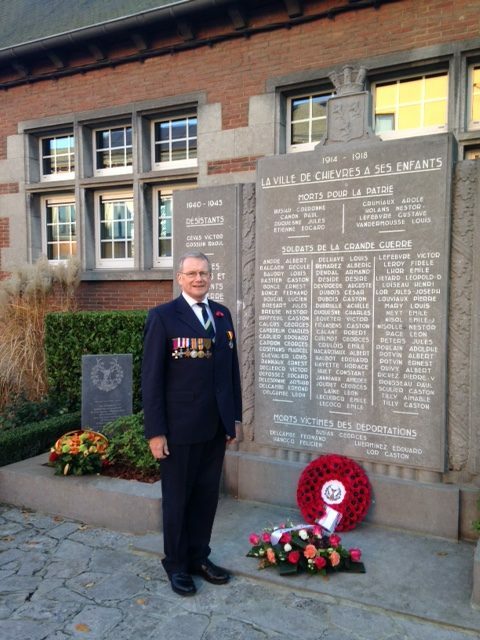 After a welcoming address by the Mayor of Chièvres, the procession continued to the community’s War Memorial for the unveiling of two commemorative stones, in recognition of the relief of the city by The Gordon Highlanders. Two Gordon Highlander veterans, Norman Fraser and Brian McIntosh, unveiled the Belgium Flag from one stone and Monsieur Robert Loquet, a 100 year old Belgium Army veteran, unveiled the Union Flag from the other stone. Following this, Major Grenville Irvine-Fortescue read out a message on behalf of the last Colonel of The Gordon Highlanders, Lieutenant General Sir Peter Graham. 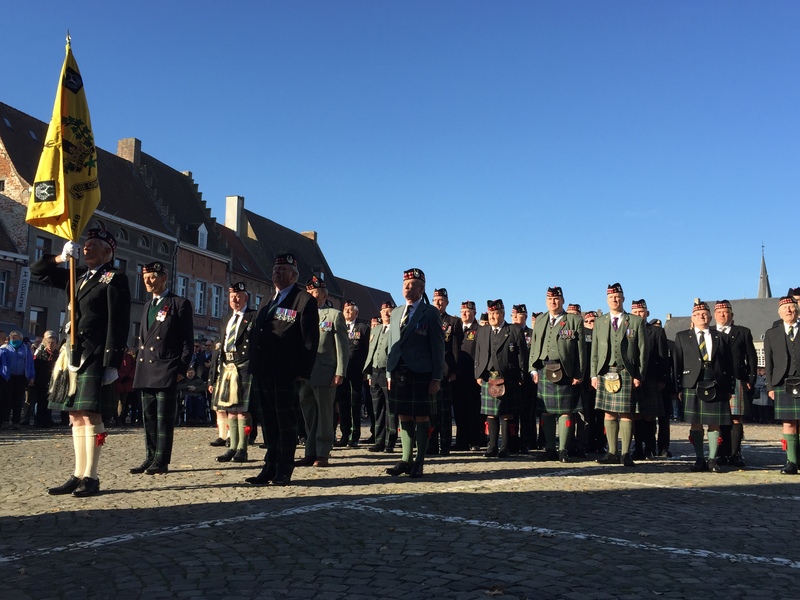 Major Irvine-Fortescue said: “I am so glad that a representative party of The Gordon Highlanders has travelled from Scotland to celebrate the 5th Gordon Highlanders arrival in Chievres on 11 November 1918. “The battalion flag was presented to the city which later conferred its freedom on the battalion and presented a gold key to the battalion. “Ties like this can never be broken and I am so glad that they are being remembered a 100 years later. Mr David Crippin, grandson of Major Wood, who relieved the city on 11 November 1918. After the speech a presentation of the Commemorative Regimental Flag was carried out by Mr David Crippin, grandson of Major Wood DSO, MC, who led 5th Gordon Highlanders into the city on 11 November 1918. The parade then marched back past the War Memorial, and a wreath was laid by Fiona Hill, Secretary to the Lieutenancy of Aberdeenshire, on behalf of Her Majesty’s Lord Lieutenant of Aberdeenshire, Mr James Ingleby. To officially close the day of commemorations, a pipe tune entitled ‘Chievres’ was played by the Drums and Pipes of Aberdeen University Officer Training Corps during the Beating Retreat, before being presented to the Bourgmestre by the Pipe President of the band, Major Graham Wilson RAMC. On November 11, 1918, after four years of military occupation during the First World War, the town was liberated by the 5th Battalion of the Gordon Highlanders, led by Lt. Col. Dudley Gordon. In 1918, the soldiers, who were recruited mainly from the north of Scotland, spent a few weeks in the city. People sang, danced, gave gifts, and celebrated freedom with drums and pipes. Liberators also participated in a triumphal procession, and a big reception attended by both Scottish and Belgian representatives. Emile Dooms, the mayor of Chièvres at the time, received the regiment flag, and the 5th Battalion left Chièvres with the key to the town. 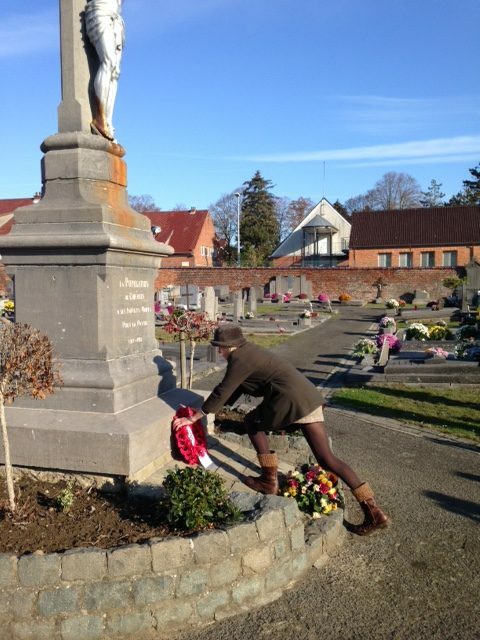 To this date, the arrival of the Scottish Soldiers remains a very important part of history for the town of Chièvres, but also for the Gordon Highlanders. In 1966, another ceremony was held in Chièvres to present a new Regimental Flag, the original one having been burnt by the Germans during the occupation of the city in 1940. Lord Dudley Gordon, who had commanded the Battalion in 1918, again led the parade and presented the new flag to the Mayor. On the same day, a twinning ceremony took place between Ellon and Chièvres, with a declaration of the Freedom of the City being granted to Lord Gordon. A number of streets in the town were named in memory of the affiliation, one being after the Commanding Officer; ‘Rue Dudley Gordon’.